Casetta Verdi is spacious and inviting. Casa Peña Serena (Serene Home) offers 3 fully furnished guest houses for your vacation. Rent them together (capacity 12) or separately. We feel everyone should experience a good night's sleep and have provided tempurpedic sofa sleepers so that all beds are equal. All units include WIFI, cable TV, and 'kiva' fireplace, off-street parking spot, Bluetooth stereo. Units share an enclosed patio and furniture, top-of-the-line grill, and laundry room. 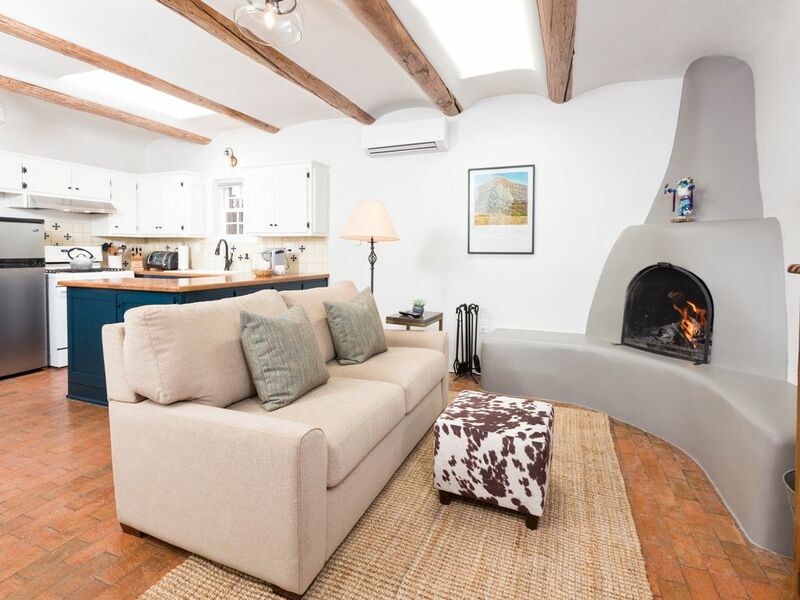 In the heart of downtown Santa Fe, Casa Peña Serena is located on a quiet cul-de-sac. Each three units have historic New Mexico architectural details, and modern upgrades, provide all you need for a home-away filled with comfort and serenity. Walking distance to world-class dining; Santa Fe Plaza, concerts, museums and shopping, rooftop bars for sunset viewing, art districts of Canyon Road and The Railyard, where you'll find the Farmer's Market, SITE Santa Fe, and RailRunner commuter train to Albuquerque,— all within a few blocks, you could not be better situated to enjoy The City Different! Please visit our property website for our history. We've provided links to our favorite restaurants and attractions. Hi there! I'm Hether, Booking Director of Casa Peña Serena. I've lived in Santa Fe for 10 years, and am originally from California. I moved here for the amazing combination of access to nature with world-class culture, in an easy-going city that is Santa Fe. I own Canyon Fine Art, am an art agent and design consultant if you need any advice on fine art while visiting! The property owners are art clients of mine, and when this property came on the market, we teamed up to renovate and modernize, while preserving the incredible historic charm of this 100-year-old adobe triplex. I jumped at the chance to upgrade each cottage with modern amenities, while respecting and highlighting Santa Fe's unique architectural history, and creating each into a sanctuary to give you a taste of why I fell in love with Santa Fe 10 years ago. Mini-Split wall unit, which works to efficiently keep the air at desired temperature setting throughout the fluctuations of day/night. Remote control provided. Radiant floor heat, and Mini-Split wall unit with remote control for overall ambient temperature control. Hotel grade 100% Supina cotton sateen sheets and non-allergenic pillows and comforters. Located in shared all-access laundry room at end of enclosed courtyard, detergents provided. Laundry hamper provided in bedroom. Also located in shared laundry room. Traditional Kiva fireplace with firewood and tools provided between Nov. 1st - May 1st. One designated off-street parking space provided. More street parking for extra cars just 1/2 block away. Strong designated WiFi per unit. Fully equipped kitchen for 4 people: dishes, silverware, wine opener, Tupperware, cooking pots & pans, mixer & mixing bowls, baking pan, teapot, pitcher, cutting board, serving bowls, toaster oven. We stayed here for a quick ski trip over the New Year. The temperatures outside were frigid 9-21 degrees with snow falling, but the Casita was warm, cozy, and comfortable. The amenities were high-quality, including the mattress on the pull-out couch! the kitchen was organized and had everything we needed to make a few meals, the bathroom is small, but warm and the shower is excellent. The bedroom is roomy, serene, and oh so cozy with the heated floors in the morning! We loved our stay and wish we could've visited even longer. It is a perfect place for a couple's getaway, a small family or friends adventure. Location is also awesome... within walking distance to numerous restaurants and the square! We would like to return in the summertime so we can enjoy the location a bit more, as we were limited by the snowy streets. If you are considering this place... go for it! We stayed over the Christmas season and found it very comfortable and very clean. We loved having a kiva fireplace with plenty of wood provided. It is a small Casita but comfortable for one or two people. It is about a10 - 20 minute walk to the square in Santa Fe or a quick 5 minute drive. We had a couple of small cliches with the heat and a plugged toilet. The owner, Bruce, happened to be in site, and both issues were quickly resolved. The facility's manager, Heather was very attentive, making sure all of our needs were met. Fantastic property in prime location! We had a wonderful stay at Casetta Verdi. I would highly recommend this property both for its location and the casita itself. Would definitely stay here again! Modern, all the amenities, perfect location, quiet neighborhood. The location of the casita was perfect - 20 minute walk to the heart of the Plaza district with shops, restaurants, galleries galore. 15 to 25 minute walk the other direction had tons to offer as well. Very clean, great Northern New Mexico feel. Highly recommend. More than two people, even if little children, would be tight. And whoever sleeps in the pull out couch (which we did not use) would have to pass through the main bedroom to the bathroom. The neighborhood is quiet and reasonably well located to the Plaza. It's about a 15-20 minute walk. Two very good restaurants are within easy walking distance of the unit. We recommend both Radish and Rye and Joseph's. Thank you so much Les! Glad you enjoyed afternoons in the courtyard. We loved hosting your stay in Santa Fe and hope you'll come back soon. Great little cozy casa within walking distance of the Plaza. Super cozy, quaint casa that had everything you needed for the kitchen, bath and living quarters. Also had a laundry room. I will definitely stay there next time I am in Santa Fe. Everything super easy about checking in. Loved the patio area also and wished I could have stayed longer to use the grill they had outside. A hidden gem in Santa Fe. I would give it 6 stars if possible. Oh thank you so much for this lovely review. I am so glad we had two of the units available for your family, so you could share the courtyard and picnic table and have an extended outdoor living room and large dining place for everyone. We look forward to your return!